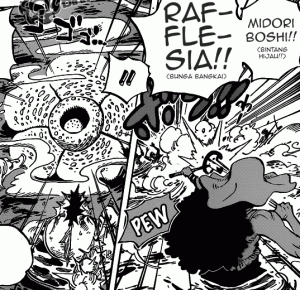 On this post, we’ll try to present some of the Indonesian related things in both of the One Piece manga and anime version. Similar with the last post, which is the Indonesian related things in Dragon Ball anime, there are some of the Indonesian related things which maybe most of us didn’t realize about that when we were reading the manga or watching the anime. However, I guess it’s normal if we didn’t realize that when we read it or watched in the first time, since we can’t know what in Oda-sensei’s (the author of One Piece) mind when he was making, whether he really took the Indonesian things to put it in his manga and anime or simply just a coincidence. In spite of that, we are going to relate the things that are found in One Piece to the “Indonesian things” by providing proofs of it. Here we go..! One Piece itself is a manga that first serialized in Weekly Shounen Jump Magazine on August 4, 1997 until now. 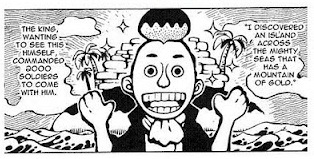 The series is written by Eichiro Oda. The story of One Piece is about a world of pirates where a boy named Monkey D. Luffy is trying his best to become the pirate king by searching for a secret treasure named One Piece that was hidden by a legendary pirate. In his way for achieving his goal, Luffy met a lot of friends which become his nakama (crew), they are the three swords Roronoa Zoro, the navigator and thief Nami, sharp shooter Usop, the masterchef Sanji, the animal doctor Tony Tony Chooper, the archeologist Nico Robin, the Funky cyborg Franky, and the melancholy skeleton musician Brook. Together, they travel around the world in the name of Straw Hat Pirate to find the sacred treasure One Piece. The series itself has been running for 14 years, it’s been running for 15 years on the August 4 this year. 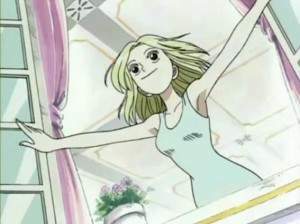 The series has been adapted into anime that has been airing in Japan from 1999, 3 OVA’s (Original Video Animation), 5 television specials, 11 movies, and plenty of video games. Currently, One Piece is ranked as the best selling series of all time in manga history, beating the Dragon Ball series. Now, let’s see what are the Indonesian related things that we can find in One Piece..
Kaya is a rich girl in the beginning of the series who gave the Straw Hat Pirates their main ship, which named Going Merry. The word “kaya” itself in Indonesian Language means rich. So, there’s a chance that the kaya word was used as the name of the girl since her family has a lot of money in the series. The Jaya Island took place in the Skypea Arc as an island that’s divided into two parts because of an accident, made one part of it stuck in the sky that became Skypea Island. Irian Jaya itself is a name of an island that’s divided into 2 region, the west side, named as Papua, belong to Indonesia and the other half is New Guinea territory. 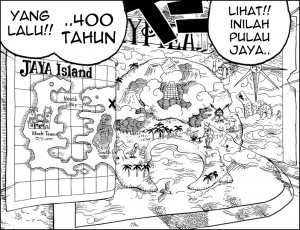 There’s a high possibility that Oda-sensei chose the name of Jaya Island from the name of Irian Jaya. In the One Piece story, Jaya Island also known as an island with a mountain of gold. 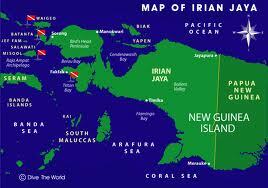 Same goes with Irian Jaya Island, where there’s Grasberg Mine which is the largest gold mine in the world. 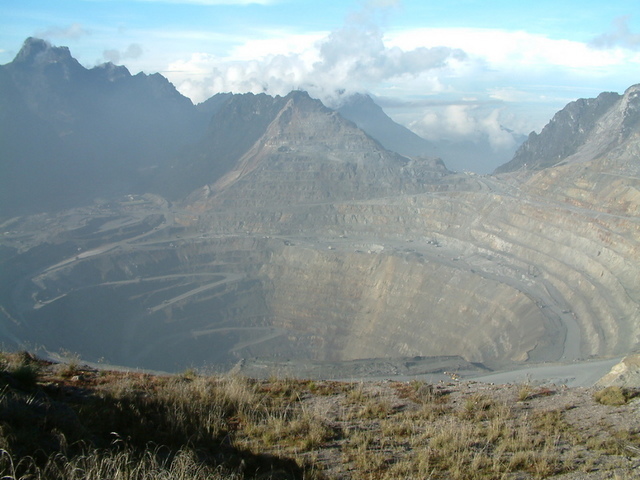 Grasberg Mine itself located near the Puncak Jaya that is the highest mountain in Papua. Those images are taken from One Piece manga volume 51 chapter 492. 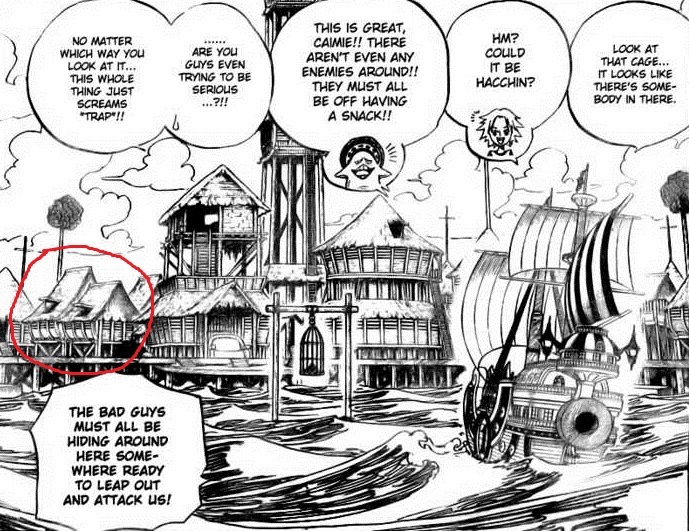 Those houses were the base camp of the kidnapper gang named Flying Fish Rider who was trying to attack Luffy’s ship. 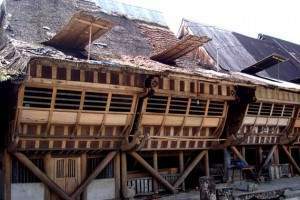 The picture on the right of it is the traditional house of Nias, which is, of course, is a part of Indonesia. Just look the the window like things on the roof, similar isn’t it? The structures of the houses also look alike! Raflessia itself is a real plant that was found in the South Eastern Asia. Originally it was found for the first time in Indonesia in 1818. 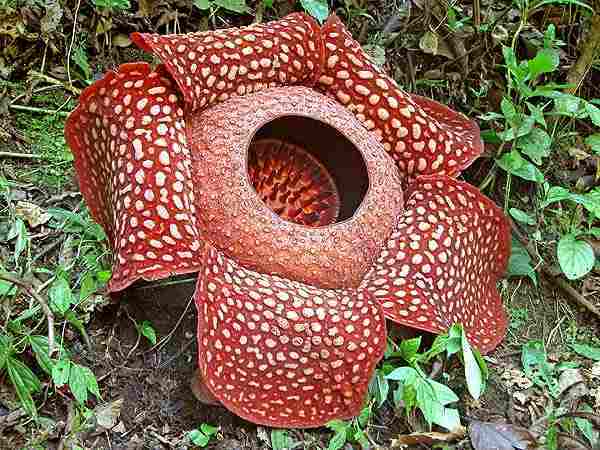 Rafflesia was found by an Indonesian guide working for Dr. Joseph Arnold in the Indonesian rain forrest. Then the plant was named after the leader of the expedition, who was Sir Thomas Stamford Raffles. Wow, great! I’m really excited when I read this one post. Eiichiro Oda is a very talented and imaginated person I guess, seems like he already traveled all around the world. In my opinion, I think Oda also had an interest to Indonesia’s culture. Besides, Japan once colonized Indonesia so at least he knew about ke-Kaya-an Indonesia. Anyway, about his knowledge of Indonesian things, I guess you have the point there since, just as you said, Indonesia is really “kaya” in terms of nature. nice page you have bro! thanks bro, we’re in really high spirit so yes the posts will keep coming, four posts a week. I hope you’d start following our blog cause it’s just… too interesting for you to miss out, hehehehe. thanks again! Don’t worry cause we’ll keep going on!!! Woww this is s good one review..
I’m an one piece fan but i don’t really notice about it afterall.. So lets be proud being an indonesian. Next time you should review more about things like this ran. I like it..
Hi Dre thanks for the comment! Sure we’ll do keep posting about this kind of things bro! Wow! Gue ga nyangka kalian bisa mencari persamaan-persamaan yang ada. Exploring-nya susah ga? You’re very welcome mate and thanks for the comment!